About a week ago a “sampler” of 12 different Robusto’s, all Cubans, arrived. For my own benefit I have decided to do a brief blog of each so I can draw conclusions and decide what to buy more of. 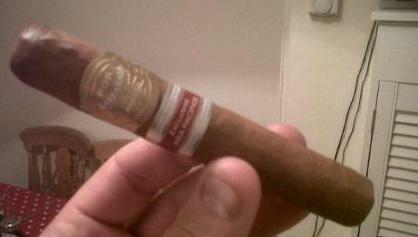 First up was the Por Larranaga. Now this is the very first cigar I have from PL let alone the first PL Robusto. It was only made as a Regional Release hence the second band below with says “Exclusivio Asia Pacificio“. Each region or market has different exclusive releases each year. This is different from the LE (Limitada Edicion) which is a cigar made for all markets but in a specific year and a specific amount, the band for these is black and gold. I smoked this while we had a small and slightly underwhelming fireworks display at home. My overall impression was of an enjoyably mild, mellow smoke with hints of straw and hay. The flavour built a little but it stayed at the mild end of things. The construction and burn was good, this was a little under packed and had a slightly open draw but nothing severe. I had a glass of red (Roero 07, M.Corregio) whilst smoking it and that worked well. If I have this again I would be tempted to have it in the morning with coffee or on an afternoon walk (or golfing / horseracing) as it was slightly too mild for post dinner. If you want a score then 88-89 would be about it. The name Por Larrañaga, which means “By Larrañaga”, was first registered in Havana by a certain Ignacio Larrañaga in 1834. It is the oldest brand of hand made Habanos still in production. For much of the 19th century and into the early part of 20th the brand was owned by the Rivero family, who built its reputation for the highest quality particularly amongst the royal houses, the rich and the famous of that time. Its golden ring attracted the attention of Rudyard Kipling who, in his 1890 poem “The Betrothed”, asserted that “There’s peace in a Larrañaga.” (This poem also contains the immortal, if obscure, line “And a woman is only a woman but a good cigar is a smoke”). In the 1950s and 1960s Por Larrañaga’s factory in Havana was a magnet for the finest cigar rollers in Cuba. It gained a standing for the unrivalled quality of it cigars and its reputation lives on today in the small range of standard Por Larrañaga sizes, which are now made at the La Corona factory in its new location at 520 Avenida 20 de Mayo.